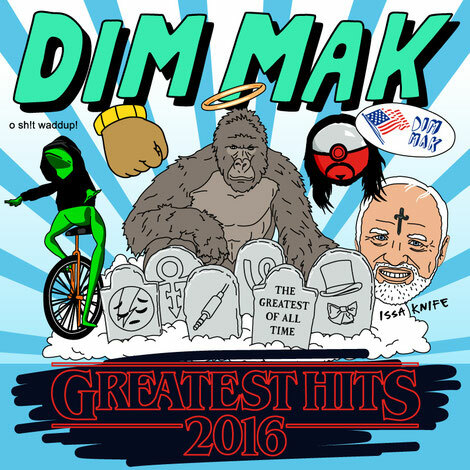 ‘Dim Mak Greatest Hits 2016’ offers a selection of the best tracks that the label has to offer from the past year. Featuring a collection of tracks ranging from trap and future bass to dancehall and electro house (and everything in between), the package features artists like Steve Aoki, Rain Man, Keys N Krates, Ookay, Garmiani, Botnek & Snails, Autoerotique, Swanky Tunes & Far East Movement, Bok Nero & Jahlil Beats, Dirtyphonics, Max Styler, MORTEN, Henry Fong and many more. Filled with 21 originals, the compilation exemplifies a diverse catalog of music released over 2016, the year which Dim Mak celebrated its 20th anniversary. Live Toronto-based trio Keys N Krates kicked off the year with their ‘Midnite Mass EP’, spawning an extensive international tour of the same name and track ‘Nothing But Space (feat. Aqui)’. Stockholm’s Garmiani followed in February with ‘Bomb A Drop’, which apparently became the #1 most-played track at Tomorrowland 2016. In March, Rain Man hit the charts with his single ‘Bring Back The Summer (feat. Oly)’, hitting #5 on Spotify’s Viral 50 Chart (both US and Global), just as the Dim Mak 20th Anniversary tour kicked off in Miami Music Week and SXSW. Dim Mak went into the summer with bossman Steve Aoki dropping his ‘4OKI EP’, led by collaborations from Autoerotique (‘ILYSM’) and Shaun Frank (‘Dope Girlz’). Moving into the autumn the records kept coming, as Philly flame-spitter Bok Nero unleashed his debut EP ‘Lorde of Legions’, featuring production from Jahlil Beats. 2016 closed out on a high note with Max Styler’s debut full-length album ‘Heartache’ and Botnek’s ‘Buffering… EP’, the latter of which contains the Snails collaboration ‘ur 2 cool’. Check the label’s website for full track info.